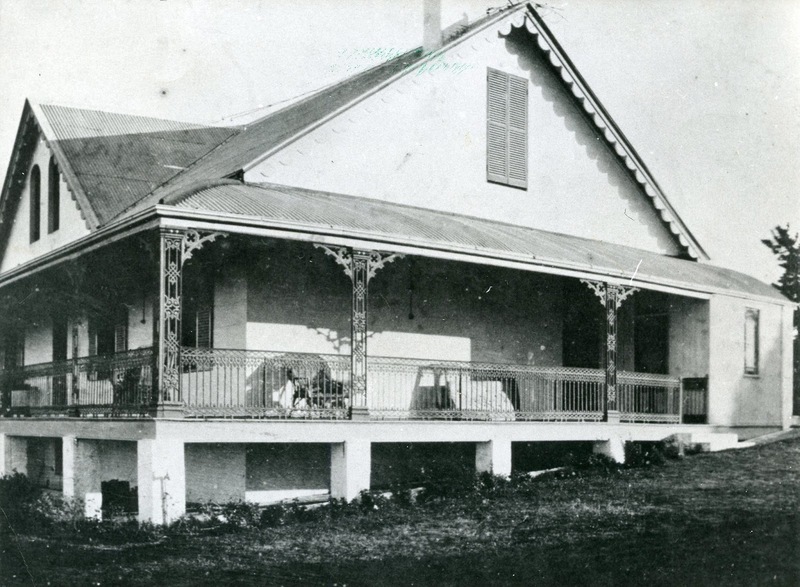 In the 1870s Captain Charles Smith, a shipping magnate, bought part of country residence built in the 1870s by the Hon John Lucas, M.L.A. (1818 – 1902), a controversial Sydney politician, financier and Secretary for Mines in the Robertson Ministry. In the 1880s Smith built a house, called ‘Logie’, higher up the hill, above the railway and beyond Lucas’s cottage. When Charles Smith died in 1897, Logie was inherited by his son, Colin (1879 – 1939). Colin Smith was an eccentric and kenspeckle figure in Glenbrook who established a bacteriological laboratory at ‘Logie’. In 1921 Logie and its estate were bought by Herwald Kirkpatrick and his brother-in-law, G.H.D. Morris (known as Jack). After a period of bad relations between the joint owners, Morris moved out of ‘Logie’ and in 1923 built his own house, ‘Briarcliffe’ on another part of the estate. Kirkpatrick, who was a well-known architect, then proceeded to convert ‘Logie’ and the surrounding 12 hectares (29 acres) into a high-class hotel, retaining the stone foundations of Charles Smith’s house. 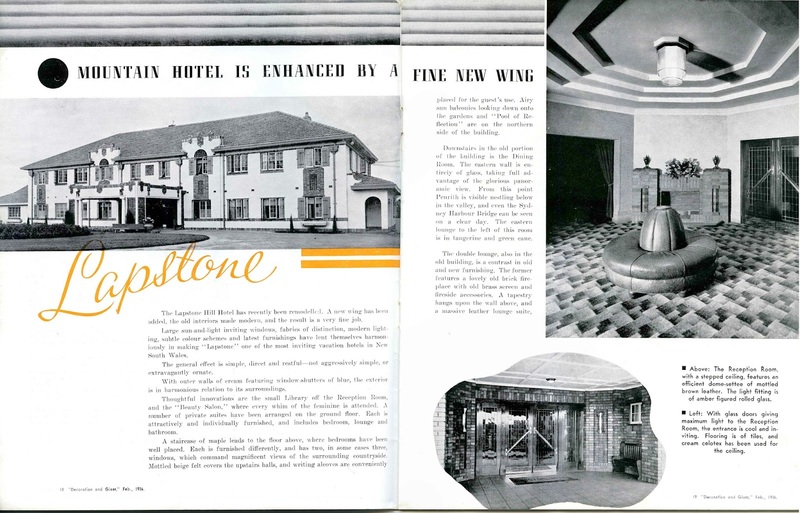 On 23rd July, 1928 a company called, “Lapstone Inn Ltd” issued a prospectus offering shares in a venture to buy old ‘Logie’ for £20 000 and convert it into an up-to-date residential hotel. “No site more picturesque could be imagined, the view across the Plains in all directions is unequalled, the climate for many months of the year is very like that of the South of France”, the prospectus enthused. There were 15 acres, mostly in beautiful gardens; and there were plans to pipe water from the Nepean River as everyone in this district still depended on tanks for water. The directors were Herwald Kirkpatrick, Sydney architect, who had designed the Glenbrook School of Arts; Samuel Farey, wool expert; and John Gordon Huston, hotel proprietor of Dubbo. The company was not free of financial problems, apparently, for according to some early Council correspondence, it was in liquidation in 1930, however it appears to have survived. Using the interior designers, Ricketts and Thorp of Rockdale and Industrial Arts Ltd, Kirkpatrick created a major Art Deco luxury hotel, which attracted admiring articles in the professional journal Building in 1930, 1936 and 1937. The Lapstone Hotel became a very fashionable place to stay and a road house bar was built at the entrance to cater for passing traffic. However there is no indication that it ever operated as a drive through bottle shop. The Lapstone Hill Hotel stands alone in the front rank of country hotels, price for price and class for class, particularly with regard to the brightness and colourfulness which seem to enfold the hotel within and without and to emanate from the views and the well-kept garden. The bedrooms, of which there are now 50, are quite small compared to what one would get, say in America, but they conform to our regulation size. They are not lavishly furnished, but they are comfortable and neat, and above all, in very good taste. The ceilings and frieze are white, the wallpapers faintly toned in pastel shades of charming design, and the carpets maintain those tonings, but in deeper hues. The bed spreads, of washable Cesarine, are one-toned to match, maintaining a balance between the figured carpets and wallpapers. There are two sets of window blinds, a dark brown for summer and a cream for winter – to keep out the light and heat. Besides a central light, there is a bedside lamp and one on the dressing table, and also a tiny electric fan for summer use. There are four styles of room, one furnished in honey coloured Australian satinwood, finely grained, one in Italian walnut, one in restful tones of green lacquered, and one in mahogany colour. Each room has a wash basin with hot and cold water, but the common bathroom and toilet, unfortunately, is general, even in this otherwise good class hotel. The price for this convenience with excellent cuisine is from £4/4/- per week per person for single room and common bathroom and toilet to £7/7/- per week per person for a private suite of a double bedroom, sitting room, bathroom and verandah. The carpeting, with the exception of that to the entrance, was carried out by Mr. Carney of Artistry Wholesale Furnishers, as well as the upholstering material, furnishing fabrics and the outside blinds. It would be safe to say that nowhere in the world could accommodation of such a standard be obtained at from 12/- to £l/l/-per day. The dainty little pale pink open-voile frilled and crossed-over curtains in the bathrooms are but one of the little things that surprise and delight the patrons. Unsightly pipes do not protrude themselves – just chromium plated shower and tans only are noticeable. The exterior is in textured brick in which the colours blend harmoniously. As so many modern buildings use unblending colours, and some use “howling” colours, it seems almost necessary to mention this fact. The approach is through a port-cochere behind a flaming bed of bonfire salvia. It is rectangular with classic corner piers and columns. The tiled flooring is in 6in. squares with |in. tile striping running between each-pair of tiles. In the octagonal entrance hall, four alternate sides arc devoted to openings –the entrance door, the passage to the suites, the hall that leads to the verandahs and ball- room and the wide office counter. Alternately between these are a Wunderlich Ruftex brick fireplace, telephone booths, an office door and the stair approach. The entrance door is in two leaves, each having a deep Luxfer panel with chromium plated kicking plates and handrail. The former dining room has been extended by taking in a portion of the front verandah, and this is reserved for the use of residents. The drawing room has been extended to double the former size. It is richly carpeted and furnished with upholstered three-piece suites in modern design. The curtains maintain the colouring of the carpet in copper green and buff. The former ballroom is now a billiard room with one full-sized table from Heiron & Smith Ltd., and there is room for another. The ceiling is in receding stages after the manner of the Soldiers’ Memorial (a Halicarnassus Tomb) in Melbourne, until it reaches the lighting panels in the centre, and here something special has been provided, in that the whole of the ceiling is covered with parchment through which a soft light filters. In a passage from the main building the wall is lined with Golden Ray mirrors to the full ceiling height, which colour tones in with the furnishing. Since Frank O’Brien Ltd. put Golden Ray mirrors on the market they have become very popular in positions such as this. There are five sets of windows 6ft. wide, curtained with overlapping extremely dainty frilled centre curtains and tweed curtains striped horizontally at the side, and the side curtaining is also applied to the three 12ft. folding doors to this room, running on McCabe’s runners. The orchestra has been given a small stage, a baby grand Beale piano, and ornate lighting stands; surrounding this it a balustrading in honey-coloured Australian satin wood. Above is a pierced duct through which the Panotrope music filters. The chairs are upholstered in tapestry of buffs and browns, and the wall settees are also carried out in this upholstery, with high backs to ensure keeping a clean wall. The upholstery work generally is along simple lines, luxuriously comfortable; it was designed and manufactured by Ricketts and Thorp Ltd and it is a compliment to this firm that, having supplied furniture to the older building, it was asked to carry out the work in the new section. The whole has been very well carried out as regards selection of materials, design, craftsmanship, and last, but very important – price. It is just frankly expressive of our modern times, is full of tone and quality without being in the least bit aggressive, or bizarre, as so many things in the modern manner can become unless discretion is exercised. The ballroom opens onto a verandah 40 feet long and quite 13 feet deep. It is furnished in green and yellow modern wicker furniture with closely woven wicker seats and backs. In addition to usual and unusual attractions such as tennis court, a deck tennis court, a reflecting pool lit up with lights on the water’s edge and a nine-hole golf course. This extract from a Blue Mountains promotional publication of 1939 gives a good, if rose tinted, description of the facilities it offered. Only 40 miles from the G.P.O. – offers Visitors unique features – the convenience of a city hotel set amidst mountain scenery. Within an easy 80 minutes’ drive along the perfect surface of The Great Western Highway. Around this Hotel is a wealth of romantic and historical interest from its spacious, cool verandahs looking out over the terraced gardens, so reminiscent of Italy and the Riviera, can be seen the places which figured so prominently in Australia’s early history. Set like a brilliant ribbon of silver, threading amidst orchard groves, the glorious Nepean River flows in the foreground. The very name Lapstone itself is romantic – a river bed flung to mountain height millions of years ago, but still the earth holds evidence of that former era in the river stones which abound – the Cobbler’s Lapstone was just such as these. When heat reigns in the city, up here the cool North East breezes refresh and stimulate. After a strenuous set of tennis or a long round of golf, the crystal river water of the bathing pool incites you to swim. When night descends you gaze away over the plains and in the distance twinkle there lights of old world Penrith, Richmond and Windsor, and beyond those of Parramatta, and like a Nimbus, the glowing radiance of the Metropolis on the sky line. Mr. Fred Poppelwell, the well-known professional, a golfer of the Australia Golf Club, has laid out a fine 9 hole course. Lockers and showers are provided at the Hotel. Of a standard unexcelled in Australia. The finest kitchen in the Commonwealth, specially designed for a la carte meals. The most modern refrigerator equipment combined with Electric and Oil Burner Cooking, assures patrons of excellent meals at any hour of the day or night. An ultra-modern combination of Fashionable Hotel and Country Club, exquisitely decorated and luxuriously appointed. Carpeted floors in all rooms and hallways, and furnished after the manner of an English gentleman’s home. Replete with every modern home convenience. Running water in bedrooms, telephones and central heating. Lapstone is approached by the Great Western Highway a pleasant 40 mile journey along a concrete bitumen surface road, which brings the hotel within 80 minutes of the city. Situated 40 miles from Sydney – three-quarters of a mile from Glenbrook Station – a car meets train. 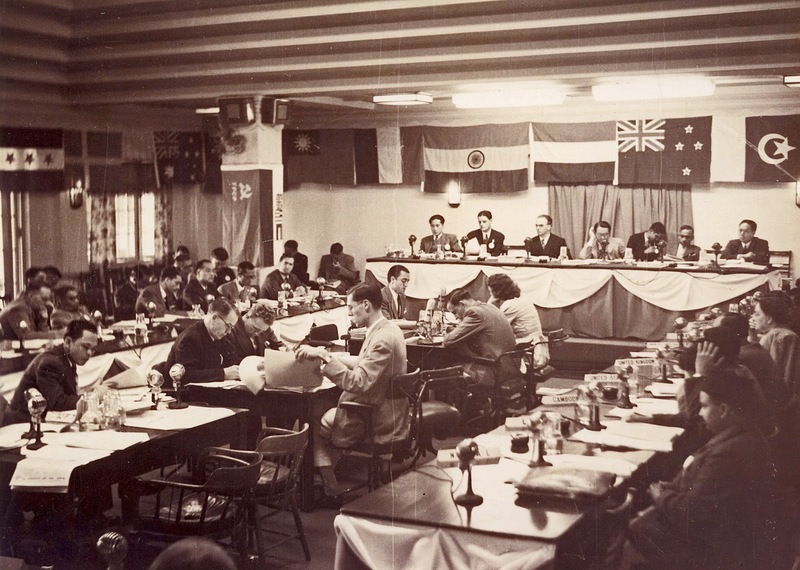 The hotel hosted a number of official and international events and conferences, including accommodation for the rowing crews in the 1938 British Empire Games, the British Commonwealth Relations Conference (Sept 1938), United Nations Relief and Rehabilitation Administration (UNRRA) (Feb 1945), the second UN Economic Commission for Asia and the Far East (ECAFE) (Dec 1948). After World War II, the R.A.A.F. Operational Command was looking for a permanent site to house its Eastern Area Headquarters, and in 1949 they acquired the Lapstone Hotel for £63,000. Both buildings are now part of the RAAF establishment and have State Heritage Listing. All images from the Local Studies collection. Thanks to Barbara Higginson for access to research notes and photos. 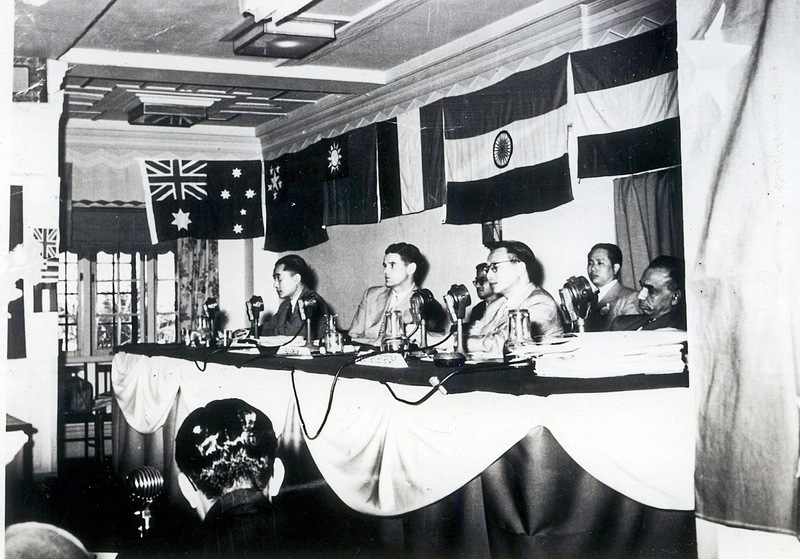 “POLITICS DISRUPTS E.C.A.F.E.” The Canberra Times (ACT : 1926 – 1995) 10 December 1948: 4. Web. 2 Aug 2016 http://nla.gov.au/nla.news-article2780061 . What a great post. The photos really add to the story. Thanks for posting. Thanks for posting about Logie. It seems that little is known about the early history of Logie. I have copies of early land titles which give some clues. John Lucas purchased 42 acres in December 1867. A portion of 5 acres was transferred to Randolph Charles Want in 1874 perhaps with a very modest stone cottage but it seems to have been inadequate for the Want family and it was transferred back to Lucas in 1875 and 2 days later transferred on to Captain Charles Smith. So perhaps the well to do Captain then extended the cottage to the more substantial 2 storey house as pictured in your blog. Want had a house built just north of the Lucas property and near to Lucasville platform, this house has since disappeared. Over a number of years Lucas tried, with limited success, to subdivide and sell the land as small blocks. This was thwarted by the re-routing of the railway in 1892.Logie is probably the first of three cottages built on the ridge by Lucas, Ulinbawn was initially a small stone cottage probably built in the early 1870s, it was purchased by Yeomans in 1883 then rebuilt to its present form. Lucasville cottage was a modest brick cottage near to Lucasville platform, perhaps both built about 1877.There is a lot of interesting history here but unfortunately there are gaps in what is known. Would like to know more.